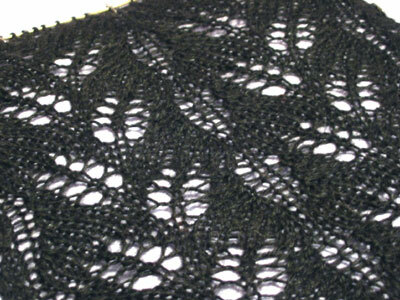 I wanted a black lacy scarf and had bought some Joseph Galler Superfine Prime Alpaca for this purpose. I had originally planned to design the scarf myself, but then I found this pattern on Ravelry and decided it was perfect. And a hat for my dad (who, after six months of chemo still has a full head of hair), if my mom, dad, and I can ever agree on what constitutes a warm and wearable but not-doofy hat. Currently, we are at an impasse. My dad likes those hats with furry brims and earflaps, and my mom and I both find those Extremely Doofy. My mom likes this one hat she bought, which I also find Extremely Doofy, and my dad refers to it as a Communist hat. I rather like the ski hat from Never Knit Your Man a Sweater, but I suspect my dad won’t like the top. Ahh, the joys of knitting for family. If you know of any not-doofy patterns for a man hat, please leave a comment. CogKnition posted this on December 2nd, 2007 @ 3:18pm in Unfinished Objects | Permalink to "December is Lots of Teeny Projects Month"
Re: non-doofy patterns for guys – I’m going to try this one next. It is a basketweave cap.